I have met the pleading eyes of my son; I’ve turned away from the batting of my daughter’s eyelashes; I’ve ignored the quickened beating of my own heart; I’ve walked away from the feed store again and again, empty-handed. I’ve done it so far: I have resisted buying new chicks this spring. I have–I think–several good reasons. We’ve got an excellent laying flock, and we are getting buckets and buckets of eggs every day and I’m not really wanting to cull this flock in the fall, as is my usual wont. I think I’ll keep them on for another year. I just can’t butcher chickens in their prime! We were planning a trip in May, and I was loathe to have brand-new chicks for our hired help (thanks Mom) to watch over while we were gone. That’s quite enough reasons to justify walking doggedly away from the new chicks, isn’t it? Do I really need a fifth? But it has been a hard lesson in self-control. Every time we’re in Orscheln’s, we have to walk toward that peeping sound, we do–and we gaze at the cheeping handfuls of fluff. They are so dear. We always have to scoop up a chick or two and hold them up to our faces. So sweet. So soft. If only my coop were bigger. If only I actually needed more chicks. If only, if only. If only we had a little island in the middle of the pond where our waterfowl could huddle and be safe from the fox, I’d buy some ducklings, too. If only I could scoop TIME out of a bin at the store, and buy by the pound, like pinto beans. And then. Yesterday morning, I had a big surprise meet me in the chicken yard. Actually, 7 little, yet big, surprises. With their mama. Can you guess what it was, Gentle Reader? Well, I’m gonna tell you, but first, a bit of chicken-keeping lore: It happens every now and then, but very, very rarely at our place: an entrepreneurial and crafty and doggedly broody hen hides away her nest for several weeks, laying eggs day by day until she has a clutch of them, and then she sits on that nest for 21 days(ish) and hatches out her own family. In secret. When she is convinced that the chicks need to get out and learn a bit about Life, like how to eat and drink, and scratch, and chase bugs, and so forth, she emerges from her hiding place–Triumphant! Glorious! Victorious! A Champion over modern breeding techniques which attempt to make good laying stock, but never encourage broodiness. A wonder! A modern-day Miracle! Proudly she shepherds her miraculous little family across the yard, looking for food and warmth, and protection from the farm cats and dogs. 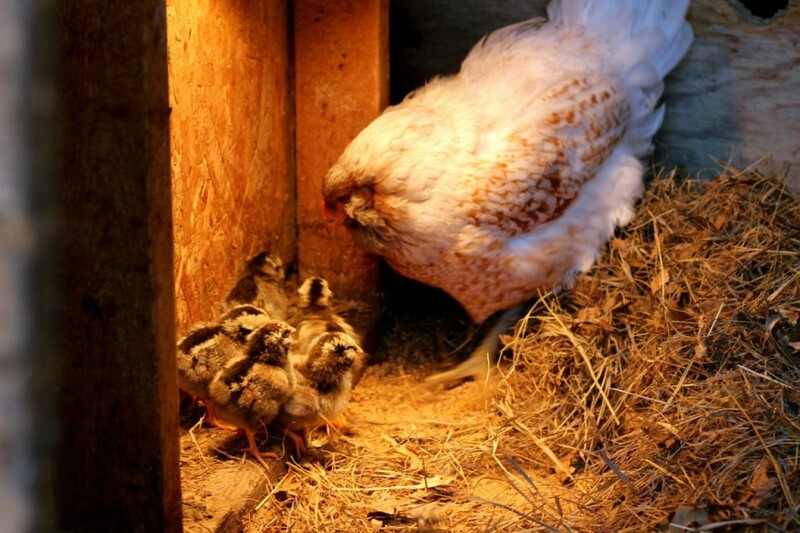 Our hens–broody or not–99% of the time lay their eggs in the coop, and we pick them up (the eggs). If I decide to let a broody hen have her way and try her hand (so to speak) at hatching eggs, I will first try to move her (and her clutch of eggs) to a separate room, the “nursery” part of our coop, so she won’t be bothered by the other hens while she is sitting on her eggs. If she won’t put up with this treatment (most times, she won’t), she won’t succeed at hatching her eggs, because the other hens will bully her and lay eggs where she is sitting and all is lost at that point, new-chick-wise. We have 5 farm cats, which have the run of the place. They are all good mousers, and given the opportunity, good chickers. ‘Nuff said, eh? But now and then an unusually crafty hen will hide a nest so cleverly that Bea won’t be able to find it, and the cats will leave it alone too, and then she may succeed at hatching out her own chicks. And this is always a surprise and a delight to us all. So it was yesterday morning. Recovering from the flu, preparing for a funeral, I was getting ready to trudge out to the chicken yard with my mom, who had stopped by and took one look at my face (You’ve lost weight! Things must be bad!) and insisted on helping me with my chicken chores. It was cold, gray, and windy. I was cold, gray, and . . . . well. . . I was cold and gray, too. 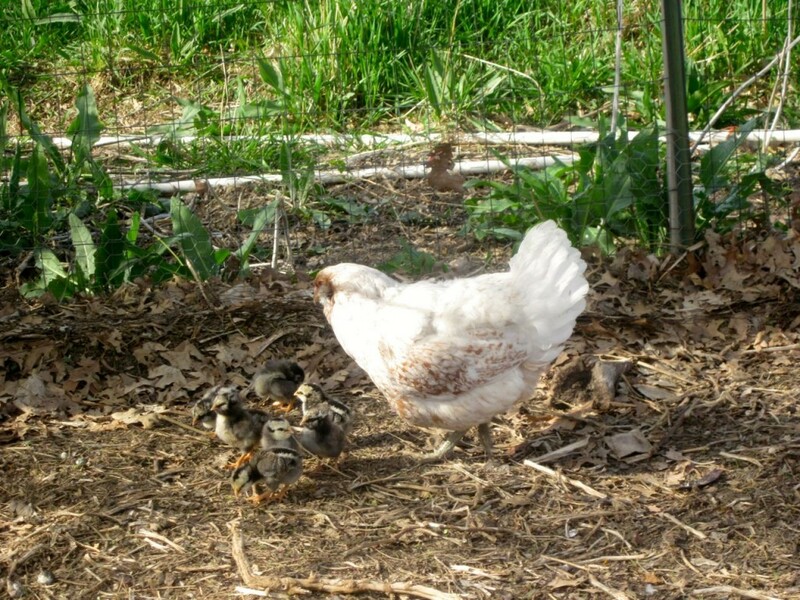 And what before my wondering eyes appeared, but 7 delightful little chicks, with their Mama, Lulu, a white Americauna hen who had been exhibiting some strange behavior. Hiding out at night. Showing up every morning, very early, before I even let the chickens out of their coop for the day. Clucking around the fence line for her breakfast after I let the chickens out. Disappearing for big chunks of the day altogether. Yup. Mysterious. Here’s the cool thing: she had hidden a nest so skillfully that Amalia and Grandma were hard-pressed to even find it, when I sent them to make sure that there weren’t any fluffy stragglers left behind. This little mama had to lead her new family through a morass of hay bales, through our junk-filled shed, across the cat-filled pasture, to get to the chicken yard. And they made it! We are so happy with this new family! It feels to be a peculiar and distracting blessing, at the end of a hard week for us. I can’t wait to show everybody, especially my granddaughter Anya. She’ll be entranced by these babies, I just know it. Mom and I scrambled to find a chick feeder and waterer, and to put some fresh bedding in the nursery for the new family. But wait, like any good grandma I’ve got a couple of pictures to show you! “The world is a wondrous place, my lovelies, but you must watch out for the cats, and the dogs, and the fox, and the fast-running boy, and the car. . .
I’m pretty sure that I’ll have a few more pictures to share with you, Gentle Readers, in the days to come. Maybe a few (cough) hundred. Thanks again for reading! I’ll be sharing this post with the nice folks over at The Prairie Homestead. Come on over! What’s that line from Jurassic Park? Nature will find a way. I bet you’re happy you resisted buying some now! Boy, the coop would REALLY be crowded if I had, Christina! Well, I must say, What a Great Surprise for your birthday! Wish you were feeling better physically and I can imagine the loss of Madge, your mother in law, doesn’t help. What is special is her birthday was a gift in itself to her mother since she was born on May 10, a day mother’s day falls on some of her 91 years. I, too, have 2 guys I know, who were born that day. 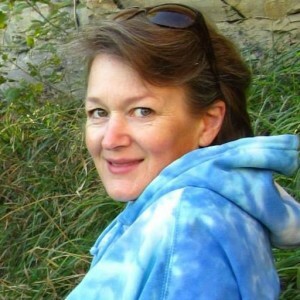 I love your pictures and your writing. We have baby goats and pigs this year. We had the pigs “til” the garden this year. New experience for us. I’d love to see pictures of that! I’d love to get a few pigs, myself! I am so sorry the stomach flu has traveled from upstate New York (it’s done its work here and I had a mild version on Easter Sunday-ugh) to where you are – and what horrible timing too. 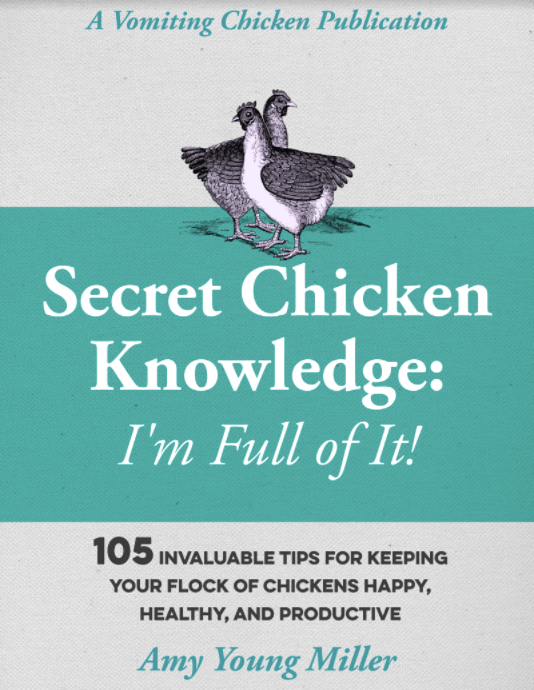 I’m happy, though, that you got a totally unexpected surprise – grandchickenmama. Waiting to see some more cute photos soon! You can’t imagine how many pictures we’ve already taken. And I’ve taken quite a bit of time out of my planting schedule to just sit and watch this little family. Absolutely precious! What a delight seeing this story unfold through your eyes! 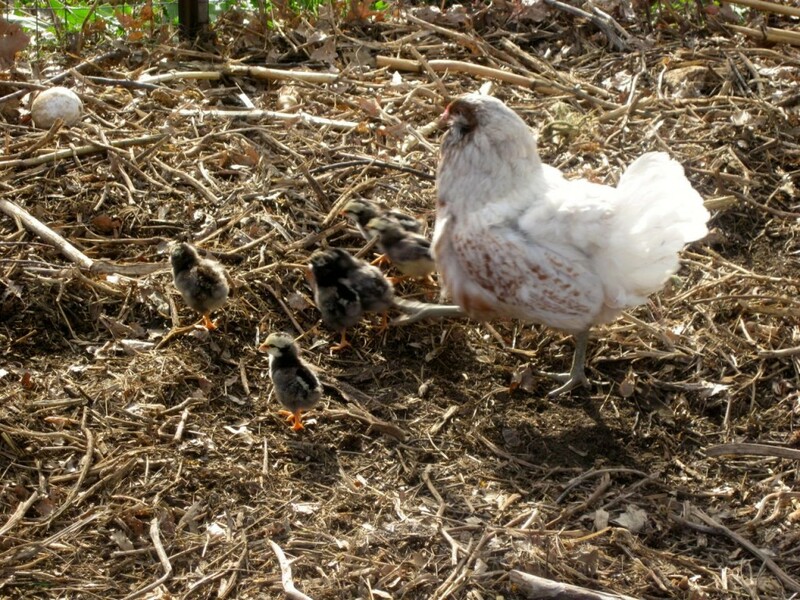 I love the tenacity of the mama hen. Love that she had the smartsl to defend her babies. Love that she brought this surprise into your lives. And I love that you waited without an inkling of what was to come. Those are the beautiful things in life. And how you welcomed the unexpected turn of events made it worth the read. Thanks for your bright-eyed wonder seen in this story. I love your comment. Thank you so much for stopping to read my story, and for taking the time to write such a nice thing to me. Blessings! What an adventure raising chickens must be. Yes, Sojourner, it is an adventure! How simply wonderful, Amy! Glad you got the best birthday present ever! Thank you, dear Caro! It really was very sweet. Aah, this is so sweet…and wonderful…and precious! I, too, have a white Ameracauna, but she definitely isn’t the broody type! I call her Little Anne with an E. Besides, I have no roosters. Pretty safe to say, no babies in my hen house! I will watch your saga of their little lives and fill my empty nest syndrome. I just lost another hen and had to bury her. Tears. That makes five that I have lost this winter and spring, and I can’t find the culprit. I hope you have no killers, but with the dog, cat, car, fox and boy, to say nothing of the other hens, I will have to say special prayers for their safety. Thanks for a wonderful surprise story! Thanks Mari, and I’ll say a prayer that you find your “Dreaded Varmint” and he gets what’s comin’ to him. Grrrr . . . nothing gets to me like a mysterious predator that takes one chicken at a time. . maddening! Ah, what a lovely post Amy! I love the pictures of your chickens. They are all so cute! Aren’t they sweet, Sophie? Thanks for reading! What an interesting story. Including the pics was nice too. As they say, when there’s a will, there’s a way. I’m looking forward to returning to Mexico in the fall and seeing how our little brud turned out. Include more pictures are they grow. This is in fact my favorite way to acquire new chicks as they are splendid with their mother and meld into the flock gradually and gracefully. And, Julie, when the mama is raising the babies, it’s so much easier for us!